If you’ve never tasted it before, it kind of tastes like beef jerky but it has its own pungent smell, intense flavor, and unique texture. It’s a little hard, but when you chew it, it gets soft with a lot of savory flavor. I usually slightly toast it over an open flame on my stove before eating it. Sometimes I skip the toasting and just eat it straight: I tear it into strips and eat it as is or I dip it in gochujang. Dried squid is loved as a snack among Koreans, but you can make many other side dishes with it. 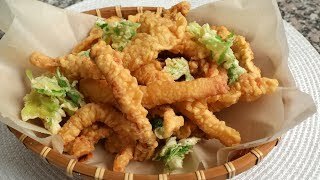 The most popular is deep fried squid, called ojingeo-twigim in Korean. You can find it all over Korea, sold by street vendors, served in restaurants, or in neighborhood pubs, but it’s always best when you make it at home because you can make it just as you like it. I like it with a thinner batter and a generous amount of squid, so I can really enjoy the flavor and texture of the squid. I don’t like a thick, puffy batter with a small piece of ojingeo inside. Frying the squid twice is essential. Just like Korean fried chicken (dakgangjeong), it might look crispy when fried once, but in a few minutes it will become soggy. Frying it a second time will keep it crispy for much longer. For convenience, you can fry some extra squid just once, freeze it, and then fry it again right before serving. Separate the arms and body of squid. Remove the bone that looks like plastic inside the squid. Use scissors to cut the body of the squid crosswise into ½-inch-wide pieces. Separate the arms into pieces with the scissors. Soak in 2 to 3 cups cold water for 4 to 5 hours until soft and flexible. Drain and pat dry with paper towels. Reserve the water from soaking. Mix the squid with 2 tablespoons flour with your hands to coat evenly. Set aside. Combine potato starch, the remaining ¼ cup flour, salt, baking powder, egg, and the reserved squid soaking water in a mixing bowl. Mix well with a fork. Heat the vegetable oil in a 10 to 12 inch pan over medium-high heat until it reaches 350 F. Drop a small spoonful of batter into the heated oil. If the batter floats to the surface in a second, the oil is hot enough for cooking. Dip each piece of squid into the batter to coat well. Carefully place the coated squid pieces, a few at a time, into the hot oil. Cook, turning a few times, until the batter is light golden and crunchy, about 1 to 2 minutes total. Transfer the cooked squid to a strainer. Repeat with the remaining squid pieces. When the squid pieces have all been fried once, fry them again, 3 to 4 minutes until very crunchy and golden brown. Drain on a paper towel-lined plate. Make a soy vinegar dipping sauce by combining soy sauce, vinegar, hot pepper flakes (if used), and sesame seeds in a small bowl and mixing it well. Serve immediately, with the sauce. Posted on Wednesday, February 13th, 2008 at 9:15 am. Last updated on September 22, 2017. Posted August 23rd, 2013 at 3:38 am | Log in to reply. Posted July 7th, 2011 at 4:53 am | Log in to reply. 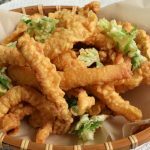 I am Korean living and working in Singapore..
Last week, my 3 kids craved for the Korean street food.. As such while I was looking through your website, I found the perfect menu!! This was it. The fried squids and sweet potato were so tasty and it perfectly matched well with the dok bok ki – dipping the fries into the sauce!! Posted July 7th, 2011 at 2:45 pm | Log in to reply. Posted July 29th, 2010 at 4:27 am | Log in to reply. Hi! I made Japchae for dinner last night and Kimchee chigae the night before. Tonight it is Doenjang chigae. We do eat alot of Korean food in my house although we are chinese. All these dishes I learnt from your site. Thanks again for being there as a point of reference and inspiration each time I have to cook dinner. I’d like to add one more dish to my repertoire – Squash patties (saw that in a korean drama). Can I use the batter for Fried squid dish to make squash/zuccchini patties? If not, can you let me know how it is done? Thanks. Posted July 29th, 2010 at 8:29 pm | Log in to reply. I don’t know what Squash patties. Anyway, as long as you can cook many Korean dishes, why don’t you experiment! : ) I think you can make it. Posted November 3rd, 2011 at 2:24 am | Log in to reply. Posted April 1st, 2010 at 5:40 pm | Log in to reply. haha I was going to make my squid like this and I have sweet potatoes I was going to fry too; so funny that I come to see if Maangchi has a recipe similar to what I’m thinking and its EXACTLY what I had in mind! Lol thanks Maangchi(yet again)!! Posted April 1st, 2010 at 6:55 pm | Log in to reply. Posted December 26th, 2009 at 12:31 pm | Log in to reply. but I though 오징어튀김 was made with fresh squid..or am i wrong???? Posted December 27th, 2009 at 11:07 am | Log in to reply. You can make it with either one. Using dried squid gives better taste. Posted December 14th, 2009 at 1:41 am | Log in to reply. You are wonderful Maangchi. SOmetimes I get ojingeo from a Korean store that is prepared whole and is steamed I think. it is very moist and not fried. Do you have a video showing how to make this? Posted December 14th, 2009 at 6:38 pm | Log in to reply. yes, I know how to make it. Your request “Stuffed Steamed squid” recipe will be posted in the future. Thank you! Posted September 8th, 2009 at 6:05 am | Log in to reply. I have lot of dry squid from my country and don’t know what to cook. Thanks for fried squid recipes but could you please tell me what starch powder is ? I only see in the store like all purpose flour, bread flour, cake flour, or corn starch, tapioca starch, wheat starch,…. Posted September 8th, 2009 at 7:26 am | Log in to reply. I like to use potato starch powder, but sweet potato or corn starch powder will be ok, too. Posted September 18th, 2009 at 8:33 pm | Log in to reply. Posted August 11th, 2009 at 11:25 pm | Log in to reply. Hi Maangchi,can i use instead of squid,dried wild baby pollack? Posted August 12th, 2009 at 9:22 am | Log in to reply. You can try, but I can’t give you a good answer because I’ve never used dried wild baby pollack in this recipe. Do an experiment and let us know the result. Posted July 22nd, 2009 at 9:42 am | Log in to reply. Posted July 22nd, 2009 at 10:56 am | Log in to reply. yes, you can, but dry it completely with paper towel before frying it, Otherwise, the hot oil will splash. Posted July 19th, 2009 at 6:26 pm | Log in to reply. Thank you so much for this recipe! My husband and I just moved to Georgia and I can’t find any fresh Korean food. I have been crazy fried squid but all I could find was frozen dried squid. Yay, now I can use it to make what I have been craving! Thank you! I am also going to try the Korean veggie pancakes. Do you ever add kimchi to them to make them spicier? Posted July 20th, 2009 at 6:04 am | Log in to reply. haha, I absolutely understand your craving for this dish. When you make kimchi jeon, add chopped kimchi and use less vegetables. I use only chopped kimchi and a little bit of either chopped onion or green onion. Posted February 13th, 2012 at 5:45 pm | Log in to reply. i know this is an old comment, but there are so many markets in Ga. we even have Korea town in Atlanta. Posted June 25th, 2009 at 3:17 am | Log in to reply. I heard about a korean dessert, named matang. The main ingredient is sweet pototes. As I am not familiar with Korean word, would appreciate if you can show me the photo and briefly explain how is matang make? Your reply is much appreciated. Thank you. Posted June 25th, 2009 at 7:34 am | Log in to reply. yes, matang is made with Korean sweet potatoes sliced, fried, and coated in sticky sugar syrup. Posted May 15th, 2009 at 4:07 am | Log in to reply. I love your video. You instructions are clear and easy to learn. This recipe was originally posted on February 13, 2008 at 9:15 am by Maangchi. It was last updated on September 22, 2017. The video was watched 552,187 times on YouTube & has 14,533 likes!